SANTA CRUZ NOIR is here! Here it is, folks! Ready for pre-order. I’m so excited to have my story, MISCALCULATION, in one of Akashic Books’ famous noir series anthologies. The book launch will be JUNE 10th at Skylight Books in Los Angeles. I may or may not be at that event, but I will definitely be at the Bookshop Santa Cruz reading on JUNE 19th. Many other events are brewing. 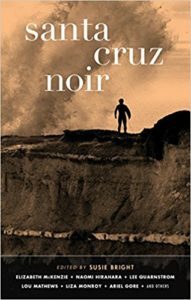 I’ll be raffling one copy of SANTA CRUZ NOIR. Sign up for my quarterly newsletter, Mystery & Mayhem, for access to this promo. And, yes, for audiophiles, there will be an audiobook edition, simultaneous with the publication.